NASAA have confirmed reports that longstanding WA grower, Steve Marsh, has recently been the victim of GM contamination despite his best efforts to avoid it. Following confirmation that the genetically manipulated (GM) canola plants have indeed contaminated Steve Marsh’s certified organic farm from a neighboring property, NASAA has decertified the affected portion of his farm (325 ha’s) until it can be demonstrated that these areas are GM free. 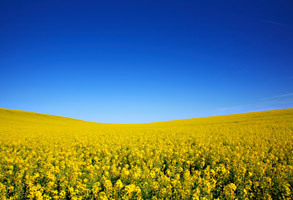 For future certification to be regained on the affected land it will require complete removal of all contaminating GM canola and proven evidence that there will be no more germination of such plants as a result of this contamination. As a result of Steve’s organic status being compromised and withdrawn across the contaminated areas for an indefinite period, he will effectively be unable to market produce from these areas as certified organic until a complete clean up has occurred if this is possible. NASAA certified organic produce has zero tolerance for GM content which is in line with the requirements of the National Standard for Organic & Bio-Dynamic Produce and the Australian National Organic Standard AS6000. This is to ensure the integrity and quality of NASAA organic produce for businesses and consumers alike. “The WA government should give full assistance to Mr Marsh to ensure that these GM plants are removed from his property as soon as possible so that he may have his certification status reassessed. This issue highlights the risk to not only organic farmers but all farmers not wishing to grow GM plants on their farms. Greater protection is needed for those who do not wish to be involved with GM crops. This occurrence clearly shows that farmers involved in growing GM crops need much stricter regulations and supervision to prevent future events. I support NASAA’s call for a full and open inquiry. GM contamination was predictable. You only need to look at the GM Contamination Register to see the regularity of GM contaminations around the world: http://www.gmcontaminationregister.org/. You can look in Hansard of the WA Parliament to see some excellent debate on GM crops over the years. Labor and Greens have delivered compelling arguments for continuing the moratorium on GM crops. Even some Liberal-National MPs raised valid concerns about the lack of public health safety and environmental impact assessments. But in full knowledge of the facts and the risks, the Liberal-National government voted to lift the moratorium on GM crops regardless. The government in partnership with Monsanto then failed to implement appropriate risk mitigation strategies which by neglect have allowed this contamination to occur.